You are currently browsing the tag archive for the ‘Ana Sentov’ tag. He even devised for himself a pseudonym for his alchemical work – ‘Ieova sanctus unus’, as a near anagram of ‘Isaacus Nevtonus’. The assumption of a name meaning ‘the one holy Jehovah’, may seem somewhat blasphemous, but it is perhaps indicative of the young Newton’s self-belief. Had he not been born, like the Saviour, on Christmas Day? Peter Ackroyd’s historical fiction and biographies of notable figures are always a pleasure to read. He is incisive, witty and brings a vast array of references to the work at hand. He has published collections of his criticism that I would strongly recommend to fans of Clive James, or Anthony Lane. In the past I have enjoyed his novels such as The Lambs of London, The House of Doctor Dee and Hawksmoor, notable for inspiring Alan Moore’s Jack the Ripper tome From Hell. In short he writes dense, yet very readable accounts of English history. 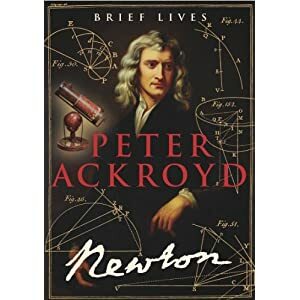 I was surprised that his book on Newton was a straight biography, part of his Brief Lives series. I was expecting a fictional account, more along the lines of John Banville’s Kepler. It remains an authoritative text, despite its slim size. Isaac Newton’s birth on Christmas Day was seen as something of a good omen, despite his sickly and weak appearance. His family’s circumstances were quite poor, his father already deceased and in truth he was not expected to live. Out of these troubled beginnings grew up a solitary, distracted young boy, already given to explosions of temper that would later be demonstrated by his inability to take criticism as an adult, as well as his controlling nature. Accounts of his early life often express surprise at his poor academic record in school, yet Ackroyd attributes this to a precocious intellectual fascination with more extra-curricular studies, such as experimenting with kites and self-made devices. His head master and other notables recognized the adolescent’s more cerebral gifts and convinced his mother to allow him to continue with his studies as opposed to a life on the farm. He eventually achieved a place at Cambridge University, where he would spend most of his life. His early fascination with optics led him to study the philosophy of Rene Descartes, even going so far as to insert a ‘bodkin’, between his own eye in order to prove through experiment his own conclusions. Even at this early stage Newton was a fierce critic of overly hypothetical discourses, arguing that experimentation and logic were the only true arbiters of reason. Such passionate self-belief would lead to confrontations with peers such as Robert Hooke and Irish philosopher Robert Boyle. Newton’s contentions with these luminaries emerge only through private correspondence for the most part, as the student was still a sheltered and private man. He was also given over to controversial religious beliefs, such as a refusal to accept the Holy Trinity, preferring early Christian notion of Jesus being the son of man, not the Son of God. In addition, his fascination with alchemy would remain hidden well after his death, as it was seen to besmirch his later rationalist successes. However, the support of Edmond Haley and his help in Newton’s eventual publication of The Principia Mathematica, a purely logical account of the forces of nature (written in Latin to warn off too-eager critics) catapulted the author onto the world stage. He would be feted by kings and tsars, contend with Gottfried Wilhelm Leibniz and be cited by Voltaire in jest, earn the acrimony of William Blake and the Romantic poets for, in their eyes, stripping the natural world of its wonder. He was even chosen to be the Member of Parliament for Cambridge, on the side of the Whig party and a staunch defender of Protestanism. His quote regarding ‘standing on the shoulder of giants’, is printed on the British two pound coin, as he rose to the rank of controller of the Mint itself. He was a remarkable man, a polymath and undisputed genius. Ackroyd shines a light on the superficially conflicting aspects of Newton. He was a rationalist with a mechanistic vision of the world who was nevertheless devoted to study of the Scriptures and the alchemical pursuit of the Philosopher’s Stone. A philosopher who has done more to define the nature of science and the necessary objectivity of the scientist. A thinker who was determined to apply himself to the practical considerations of running the Mint. This is an informed and revealing account of one of the most important minds in scientific history, who did more to define our understanding of the world in his time, than anyone since Aristotle. A brilliant man and a fascinating study.